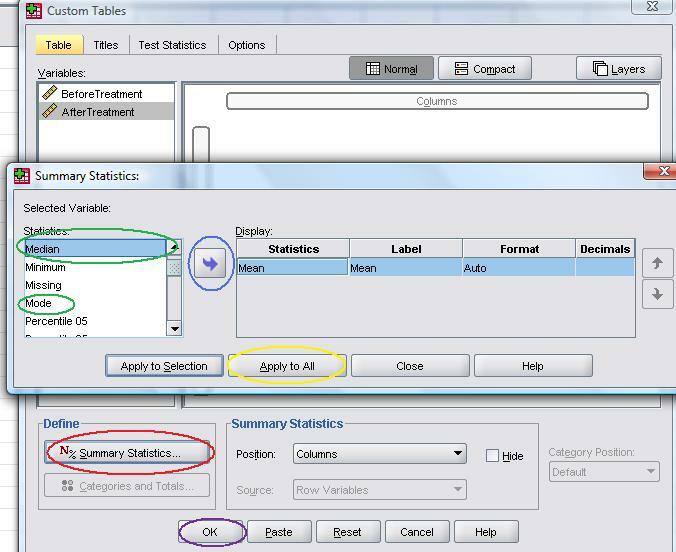 SPSS for students #1 – custom tables. 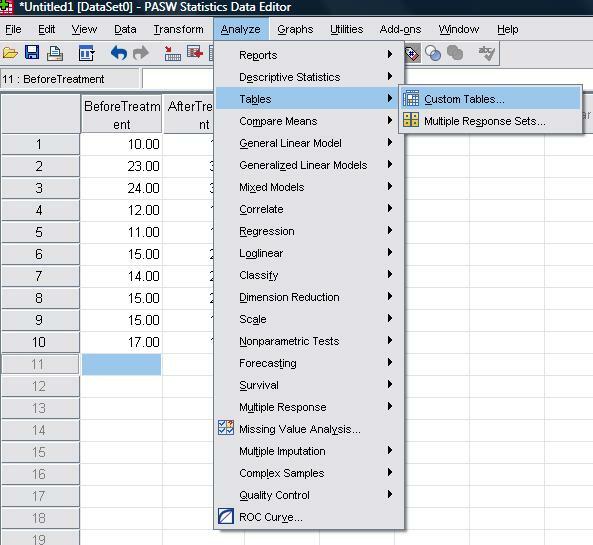 SPSS (or PASW as it is now known), forms a huge part of most Psychology degrees for students. Admittedly, many students cringe at the thought of Statistics, or even maths in general. However, SPSS is a very important program to master, especially for those interested in pursuing a career in research, or for the brave, a career involving teaching Research Methods. I’ll also point out that these are susceptible to updates, as I learn more about the subjects. So if the information you need isn’t here at the moment, check back to make sure it isn’t added in the near future. Terms in bold are included in the glossary (see the pages menu on the right). Custom Tables – why are they useful? Custom tables allow the user to quickly view important information about sets of data. Measures of central tendency can be viewed easily, and you can choose yourself what you want to be shown in the table. Another common statistic that is shown in custom tables is the standard deviation (σ). The best feature of the custom table is the ability to completely customise the layout. You can have the variables anywhere you want, and show whatever statistic you want for any variables you choose. 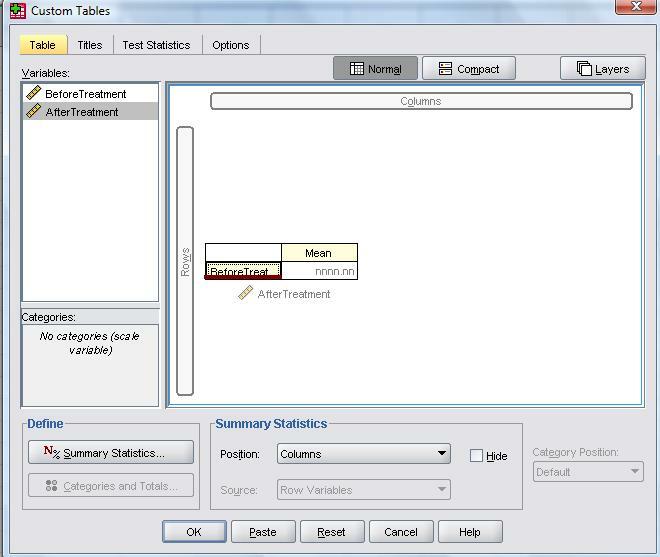 Therefore, the custom table is very important for reporting results and is nearly always included in a lab report. How do I make a custom table? 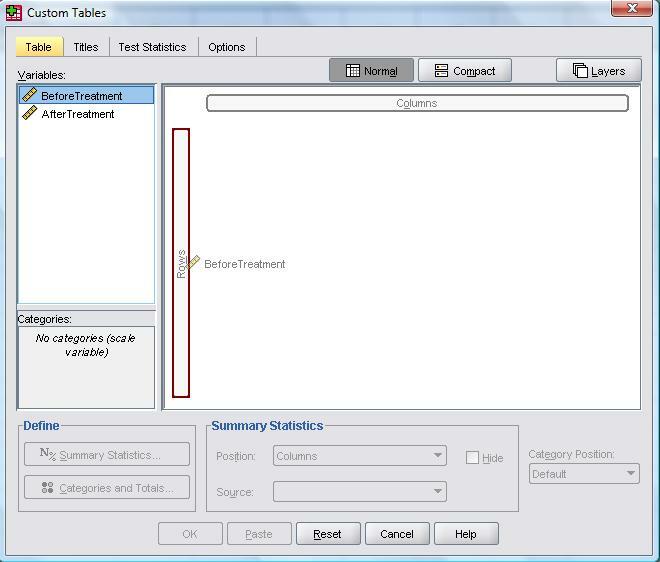 The method to get a custom table is slightly different for within groups and between groups. I’ll explain the within groups first. The next thing we’d want to do with this data is find the important statistics, such as the ones mentioned above. How do we get to a custom table though? You need to go to Analyse > Tables > Custom Tables, as seen below. This will being up the custom tables screen. You should notice your variables on the left, in a window. 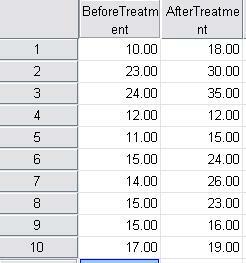 The variables here are “BeforeTreatment” and “AfterTreatment”. The next step is to drag the first variable over to the “rows” bar. Drop it, and it’ll form a small table. You’ll need to repeat the process with the remaining variable. However, you need to make sure the variable forms a line underneath the variable you just dragged over, as seen below. Notice the burgundy(ish?) line underneath the “BeforeTreatment” cell? This tells SPSS to place the variable underneath. However, you’ll notice only the mean is displayed. This is fine if that’s all you want, simply press okay and the table will be displayed, with the statistics, in a pop-up “Output” window. However, most of the time you’ll want to see more than just the mean. So how do we go about that? Simply click the “Summary Statistics” button at the bottom left. This is shown by a red ring on the screenshot below. There you have it! A fully customised table displaying exactly the statistics you want to see. From this table, you can compare means and standard deviation to get a “feel” for the data. From this, it would seem the data is significant – although a statistical test would have to confirm this! If you feel I haven’t covered the topic sufficiently, please let me know how I could improve this post. Thanks very much. If you like the blog – please subscribe and you’ll be kept up-to-date!